The president ordered the Defence Ministry to investigate the situation. 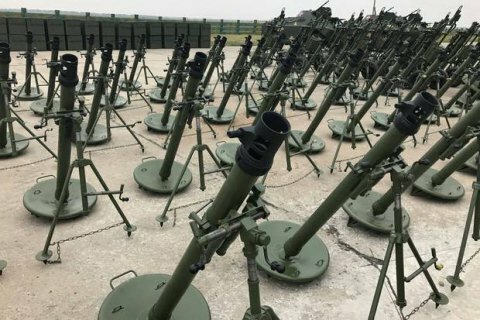 President Petro Poroshenko has banned the use of Molot mortars during military exercises.He took this decision following the tragedy at the Rivne training range, where three Ukrainian servicemen were killed and eight wounded. Western Operational Command speaker Anatoliy Proshyn confirmed to UA:Rivne that it was a Molot mortar that exploded. "I'm instructing Defence Minister Gen Stepan Tymofiyovych Poltorak, Ukrainian General Staff Commander Gen Viktor Muzhenko to urgently investigate the reasons behind this tragedy and urgently report to me next week to take all-encompassing measures to prevent it from happening again. The mentioned drills should not be used during exercises until the investigation is over," Poroshenko said. This is not the first deadly explosion of the Molot mortar. In July 2016, two people were killed during a mortar explosion at the Shyrokyy Lan range in Mykolayiv Region. On 30 March 2017, three servicemen of the antiterrorist operation troops were killed in a Mortar explosion in Avdiyivka. The Ukrainian army accepted the M 120-15 Molot mortar into service under an expedited procedure in 2016.